1. For the pastry: place the flour and butter in a food processor. Process until it resembles fine breadcrumbs, then add the bran and the cheddar. Process until it comes together in a ball, then remove from the bowl and press with clean hands into a greased 23 cm pie dish. The pastry is very soft, and it cannot be rolled out. Refrigerate until ready to use. 2 .Pre-heat oven to 180°C. 3. Cut off the hard bottoms of the asparagus (if necessary), then blanch them in slowly simmering water for 30 seconds. Remove with a slotted spoon and immerse in ice water to stop it from cooking. Set aside. 4. In a frying pan over medium heat, melt the butter, then fry the onions and thyme (remove the stalks of the thyme) until the onions are completely soft and translucent.Transfer it to the base of the tart, then distribute evenly. 5.Now arrange the blanched asparagus on top of the onions in your desired pattern. Top evenly with the cheddar. 6.In a small mixing bowl, mix the sour cream with the eggs and season well with salt and pepper. Pour all over the asparagus, then bake the tart in the oven at 180 C for 45-60 minutes, depending on how deep your pie dish is, until set and golden brown. Sift flour into a mixing bowl, add salt and rub in the butter until mixture resembles breadcrumbs. Add enough ice water to mix to a stiff dough. Roll out pastry on a lightly floured surface to 5mm thick and line a 23 cm oven proof pie plate. Place the cheddar cheese on the base of the cooked pastry case and arrange the asparagus spears over the surface. 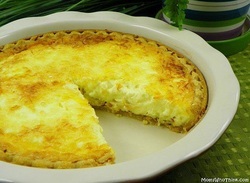 Combine the cream, eggs and seasoning and pour into pastry case on top of cheese and asparagus. Baking Blind: Place a piece of nonstick baking paper on top of pastry and weigh it down with dry beans or rice. Bake at 180 C for 10 – 15 minutes until light golden brown. Do not use wax proof paper as this will not work. 1. 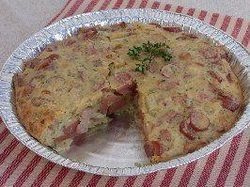 Preheat oven to 425 degrees F. Spread crust into pie plate or quiche plate. 2. Spread crust with butter. Sprinkle bacon and cheese on crust. 3. Beat eggs with rest of ingredients. Pour into crust. 4. Bake 15 minutes. Turn down to 325 degrees and bake 40 more min. Let stand 10 minutes. Brush olive oil or egg wash on bottom of crust and up sides and bake as directed. Crumble cheeses in the bottom of the pie. Spread crumbled bacon on top. Mix all remaining ingredients thoroughly and pour into the pie pan. Bake in a preheated 375 degree oven for about 45 minutes, until a pick inserted in the center comes out clean. Cool slightly before serving. Oil a round glass pan and line the bottom of pan with bread slices. Sprinkle Eskort Chopped Ham Roll over cheese. Beat eggs and milk together and pour over the bread, cheese, and ham. Sprinkle with chopped green peppers and mushrooms and onions. 1.Heat oil in a heavy-based frying pan. Add bacon and onion and fry until light brown. Remove from heat and add viennas. 2.Whisk eggs, milk, flour, thyme and seasoning together. Add to bacon and onion mixture and mix well. 3.Spoon into a greased 23 cm ovenproof tart dish. Bake in a preheated oven at 180 °C for about 25 minutes or until set and golden. In a small bowl, combine flour and potato flakes; cut in butter until crumbly. Add water, 1 tablespoon at a time, until dough is moist enough to hold together. Press pastry over bottom and up sides of an ungreased 9-in. pie plate. Set aside 1/2 cup onions for topping. Sprinkle remaining onions into pastry shell. In a large bowl, combine the egg, soup, 1/2 cup cheese, potato flakes, tuna and olives. Spoon into pastry crust. Bake at 350°F (180°C) for 25 minutes or until crust is golden. Sprinkle with remaining cheese and reserved onions; bake 5-10 minutes longer or until cheese is melted. Beat eggs in a bowl, add seasoning and cheese. Melt a little butter in a small heavy based, non stick frying pan, add mushrooms and onion. Add to egg mix together with remaining ingredients. Melt remaining butter in a frying pan and once it begins to froth add egg mixture. Turn down the heat to as low as it can go. Leave the eggs to cook gently for 15 minutes or until underneath is set. Place eggs under a hot grill for 1 minute to set the top but do not brown. Slide palette knife under the frittata to free it, cut into wedges. Serve with rocket pine nut salad, drizzled with balsamic dressing if desired.